One of the major milestones for allowing humans to fly on NASA’s Orion spacecraft is currently undergoing test preparations on the Space Coast. The Ascent Abort Test (AA-2) aeroshells have undergone fit checks at its LC-46 launch pad before being transported around the Kennedy Space Center (KSC). 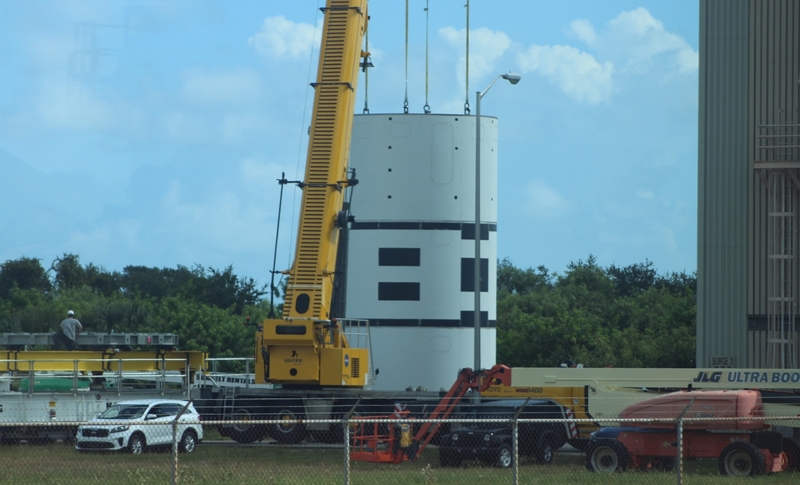 The test will launch from Launch Complex 46 (LC-46) at the Cape Canaveral Air Force Station (CCAFS) in Florida – currently scheduled to take place in April of next year. An Orbital ATK SR 118 rocket motor is the booster for the test. Its original purpose was as the first stage of the Peacekeeper Inter-Continental Ballistic Missile (ICBM). The Peacekeeper program was deactivated in 2002 and today the motors in the inventory are used for civil purposes such as space launches. The Aeroshells are essentially just an adapter between the Orion simulator and the Peacekeeper motor. However, because the Orion is much larger than the Peacekeeper motor (5 meters vs 2.7 meter), the aeroshells act as an adaptor. 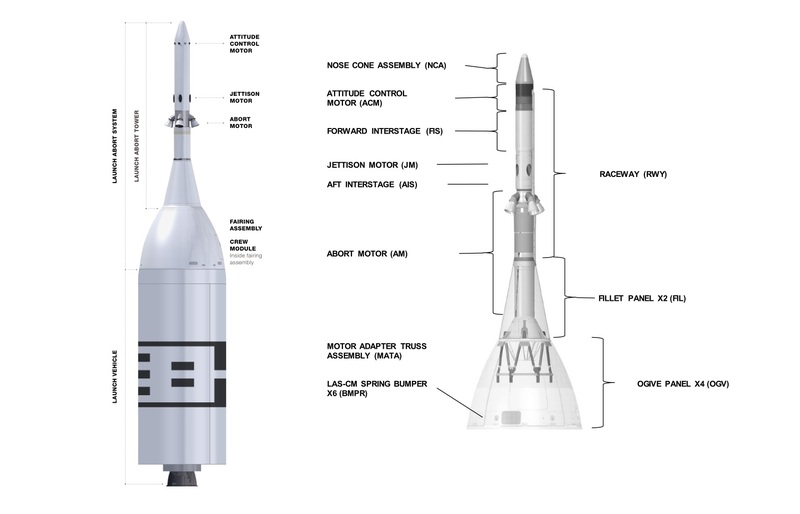 When the entire stack is integrated, the Peacekeeper motor will fit at the very center while Orion with the Launch Abort System (LAS) sits on top. 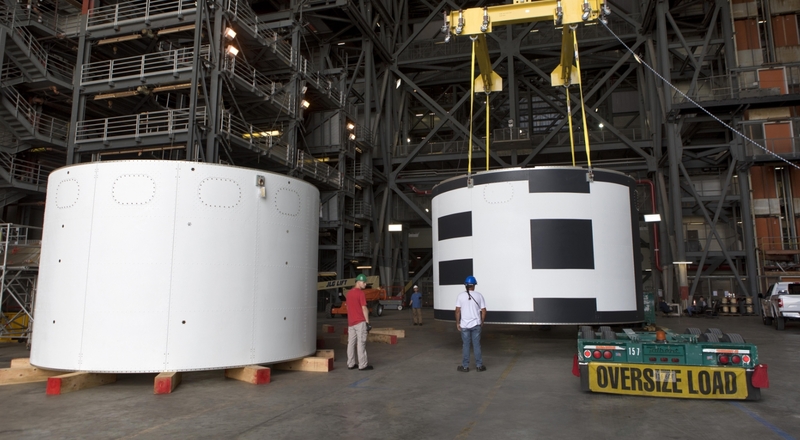 The aeroshell was shipped in three parts from EMF Inc. on nearby Merritt Island before being mated – via bolts – in High Bay 4 (HB-4) of the Vehicle Assembly Building (VAB). Integration will come later in the processing flow, which will involve the Peacekeeper booster, the Aeroshells, the LAS and the Crew Module Boilerplate Orion coming together ahead of launch. The CM is currently undergoing final testing at NASA Glenn’s Plumbrook facility ahead of returning to the Johnson Space Center (JSC) to be integrated with its Sep Ring. It was on show to the media when it was previously at JSC. To take advantage of the Aeroshell already being mated at KSC, it was loaded on to a truck for a trip to next-door Cape Canaveral Air Force Station (CCAFS). Photo of the pad fit checks, by Mark Kirasich. It was then loaded into LC-46 for fit checks, providing a view of what the aft end of the test vehicle will look like ahead of launch. Located at the Cape’s most easterly point, SLC-46 is one of Cape Canaveral’s youngest launch complexes. It was built in the 1980s to support testing of the US Navy’s Trident II submarine-launched ballistic missile (SLBM) and most recently launched Minotaur rockets. The Aeroshell was spotted again on Monday, this time back at the Kennedy Space Center, being worked on next to the vacated work site for the Space Launch System (SLS) Mobile Launcher (ML) which is now inside the VAB following its rollout to 39B. It is not clear what the current work on the Aeroshell involves, although it could be under preparations to re-enter the VAB to await the arrival of the final elements of the AA-2 vehicle. That test will be a major milestone for crewed launches on Orion. The first launch of Orion came in 2014 with the Exploration Flight Test -1 (EFT-1) test that successfully sent Orion on a test flight after being lofted by a ULA Delta IV-H. The first launch with SLS will come in 2020 when the Exploration Mission -1 (EM-1) sets sail from Pad 39B at KSC. The first crewed mission will be during EM-2, around 2022, for a trip around the Moon. AA-2 will test the in-flight abort ability of the LAS, which is designed to pull the Orion – and her crew – away from a failing rocket. During the test, the abort will be triggered when the vehicle is traveling at approximately Mach 1.3 at an altitude of around 31,000 feet. SpaceX Dragon 2 will also be conducting an Ascent Abort test with the same goal of proving they have the capability to safely abort from a failing booster.